Hi Everyone! Candace from Paper Crafts by Candace here. 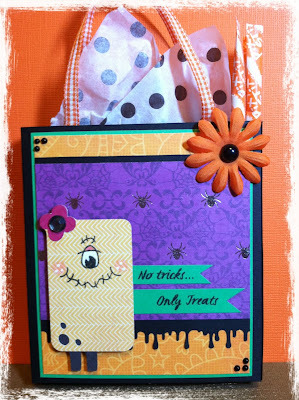 It's my Pink by Design DT day again and I'm here with a Halloween project! Yes yes I know I'm like 2 1/2 months early BUT when the mood strikes you just have to go with it! :) After making the three halloween cards that I posted yesterday, I decided that I had to make a cute little box to go with them. Good thing about this box, A2 cards fit perfectly inside!! I decided to put some goodies and tissue paper inside though to use as a present for a co-worker or friend. The monster is cut from Bump in the Night cricut lite cartridge. I used my Martha Stewart drippy goo border punch and "No Tricks... only treats" is from Pink by Design "A Haunting we will go". First Step: Score your 5 3/4 x 11 piece of cardstock at 3/4, 5.25, 6 and 10.5 inches. Step 3: Fold all score lines and cut the bottom lines as shown below. Please note, you are not cutting any paper off, just cutting tabs for the bottom. Step 4: Decorate your box! I like to lay everything out before gluing to ensure I like the placement. Step 5: Glue all your pieces together and put your box together. You can see in the picture below all my items are glued (except those that I will use a hot glue gun for). I apply tacky tape to the strip on the right, all small tabs on the bottom and only the big tab on the bottom on the left. Step 6: Start removing your tabs one at a time and slowly start piecing your box together. Here is what my box looked like after gluing it together. Step 7: Finish but adding the rest of your embellishments and some ribbon for the handles. I hot glued my flower, flower center and the ribbon to ensure they would not come off easy. I have been looking for a bag/box idea for my grandsons birthday party favors, I need something about this size and this is perfect.. Thank You!!!!! !